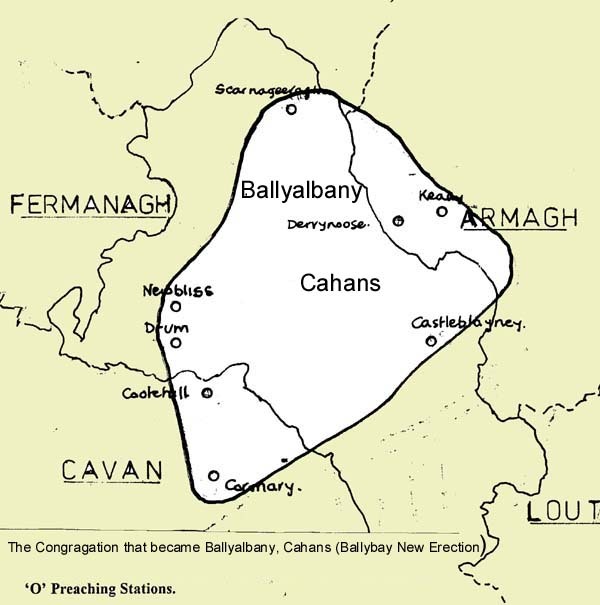 In the 1690s and early 1700s Presbyterians came to the Ballybay area of Co Monaghan in sizeable numbers. They began to worship together at Derryvalley, 2 km west of Ballybay. The first congregation was known by the parish name of Tullycorbet. About 1698 the first minister, Humphrey Thomson was ordained and ministered until his death in 1744. His successor died after 3 years and no minister was found for a further 3 years. At that time the Secession movement had spread from Scotland to Ireland and Seceder evangelists were active in Monaghan, especially one called Thomas Clark. The Seceders had broken away from the (Presbyterian) Church of Scotland. It was also a time when the official Irish Presbyterian Church, the Synod of Ulster, was slow to establish new congregations, partly due to lack of a sense of mission and partly because the government grant given to supplement the meagre salary of ministers would be reduced for each minister the more of them there were, with only a fixed total sum to be shared. By the late 1740s more congregations were needed and people were unhappy about the situation. The ministry of Scottish Seceders was welcomed with interest and enthusiasm, and a congregation was formed which later became Cahans. It was the first Seceder congregation in Co Monaghan. A small church was built. In 1751 Thomas Clark was ordained in a field thereafter known by the name of its owner, William McKinley of Caddagh. The congregational area extended from beyond Castleblayney to beyond Newbliss, and from the Cootehill and Corraneary areas in Co Cavan to Emyvale and Derrynoose in Co Armagh (see map). Visitation and preaching to so many people over such a wide area would be difficult even today when transport is easy, but then by horseback the task would have been impossible. Thomas Clark established a pastoral rôle for elders, choosing them from different areas where they had responsibility for families in their locality. They were given set questions to ask on sick and general visits about the faith and Christian living of members of households. Clark was a striking figure who ministered at Cahans and to another part of his congregation at Monaghan for 13 years, very effectively at first, although later he felt his ministry became less and less influential in the lives of his people. He was tireless on horseback visiting and ministering, preaching and teaching and establishing new congregations at Newbliss, Castleblayney and elsewhere. Determined opposition meant that he spent a term in Monaghan jail where he was allowed to minister to those who came to him. He married a member of the congregation, Elizabeth Nesbitt and they had several children. Within 6 months in 1762 Thomas Clark lost his wife and a son. They are buried at Cahans. (photograph) Less than 2 years later, after much heart-searching, planning and probably heart-break, Thomas Clark and 300 people, most of them members of his congregation, set out for Narrow Water, outside Newry, boarded a ship and sailed to New York where they all landed safely to begin a new life as pioneer settlers. This became known as ‘the Cahans exodus‘, one of the great adventures of faith which deserves to be better known. In New York Thomas Clark and his people were helped by Robert Harper who, born in Ballybay, emigrated in 1761, was appointed Professor of mathematics in New York and later became a politician. He negotiated the land on which the Cahans people first settled. Clark never resigned his Ballybay charge nor was he installed in his American congregation – it was a case of minister, elders and congregation ‘porting’ from the old to the new world. The majority settled in what later became the Salem area of New York state with Thomas Clark as their minister and leader in community building, while some moved on to the Abbeville area of South Carolina. From 1782 Clark was minister there until his sudden death in 1792. Author of pamphlets arguing for the cause of the Seceders while minister at Cahans, at his death on his desk was a ‘pastoral letter’ to the continuing congregation in Co Monaghan which remained dear to his heart to the last. The Cahans exodus, followed by generations of mainly westward emigration was part of the Ulster Scots movement of peoples, many of whom became people of prominence in American life. These included an ancestor of the Hearst publishing family who have been influential in American political and economic life. Billy Kennedy has traced their movement from Long Cane, South Carolina to California where they made their fortune and established their ’empire’ and founded the San Francisco Examiner (The Scots-Irish in the Carolinas). Furthermore it has been claimed that some 10 churches in the USA developed from the Cahans settlers and two distinguished missionary ministers, Drs John and James S Crawford, father and son, who served in Syria and Beirut were descended from them. William McKelvey, one of his students, married Anne, his daughter, and became John Rogers’ successor as minister. Matthew McAuley, the 4th minister, also served with great faithfulness for 47 years. He was a most careful record keeper and many documents from his time survive and are of sociological as well as church interest. Some Cahans church records go back to the 1750s. They show steady emigration and also people joining the congregation from neighbouring and farther away congregations. Matthew McAuley is also remembered in a memorial stone located in the walls of the present church built in 1840 while he was minister. An old tradition says that he inserted the small pebbles still to be seen in the wall at one point – as high as he could reach! A small part of the 1779 building was incorporated into the 1840 one. (illustration) He ministered through the dreadful years of the ‘great famine’ when Monaghan Presbyterian small farmers suffered severely. 1840 was the year when the Synod of Ulster and the Secession Synod united to form the General Assembly of the Presbyterian Church in Ireland and Matthew McAuley led Cahans into the union. Cahans was therefore part of a Presbyterian union of churches. Ministers then lived in their own houses, and when Cahans congregation decided to provide a minister’s house (manse) Mr McAuley’s house and farm were bought. His successors lived there at Corvoam until the 1920s.